A robust, powerful jet engine of ~7,500 lb of thrust built in Britain just after WW11 by Rolls Royce to power the new Canberra Bomber. Design was started by Rolls Royce as a private venture in September 1945 with the production name AJ.65. The AJ.65 means Axial Jet 6,500 lbs thrust. The initial design target was thrust of ~6,500lbs. Axial in the name AJ.65 means the airflow runs parallel to a central axle or shaft through the middle of the engine. Though not technically quite correct ~7,500 lb of thrust is ~4,000 to 5,000 shaft horsepower. The early Avon has 12 banks or stages of compressor blades. Late Avons had 15 stages of compressor blades with the first stage of blades at the front being low pressure and each stage after that progressively higher pressure until the air enters the combustion cans where it is mixed with fuel (Jet A1 or basically kerosene) ignited and pushed out the back. Although the first prototype was started up in March 1947 it required much testing and fine tuning to be carried out for the engine to reach a quality that Rolls Royce was happy with. Interestingly the first Avon jet engines to fly were two that were mounted on a specially converted civilian version of the famous Lancaster Bomber (called a Lancastrian) on the 15th August 1948. Further testing saw the first Avons installed in the new Canberra Bomber in May of 1949. The engine has proved very reliable and robust in service. They were successfully used in many different types of aircraft. 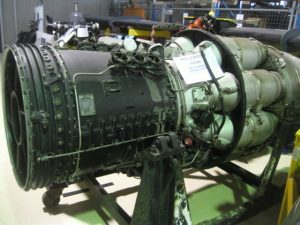 Ultimately the basic Avon design was refined and upgrade to almost ~13,000 lb of thrust in the military Avon 302 as used in the English Electric Lightning fighter interceptor in the 1960s. Interestingly it was an Avon 302 that was used in Richard Nobles Thrust 2 car that set a new land speed record of 1,019 km/h in 1983. Amazingly, Avons are still made by Rolls Royce as heavy duty industrial power electricity generators for isolated mining applications (called the Avon 200 they are rated at over 20,000 shaft horsepower). It’s not clear from where in the RAAF the HARS Avon came. Most likely it’s from a Sabre, but maybe from a Canberra. Over time someone has removed the serial plate fromthe engine and unfortunately we have no history available. Manufactured: More than 11,000 built in the period 1960-1974.